The fifth edition of this global bestseller is the most comprehensive and easy-to-use reference available on the perioperative care of the adult cardiac surgery patient. Completely rewritten to incorporate all the latest concepts in care and updated to reflect current practice and guidelines, this classic text retains the pragmatic features that have made it the “gold standard” reference that clinicians have relied upon for over 20 years. 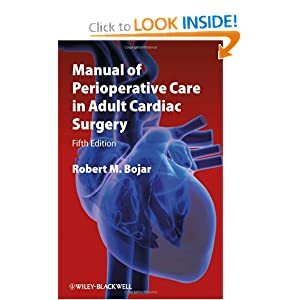 Written for Cardiothoracic surgeons and residents, physician assistants, nurse practitioners, and critical care nurses, the fifth edition of Manual of Perioperative Care in Adult Cardiac Surgery is a must-have resource for those involved in managing both routine and complex cardiac surgery patients.